"David Perdue: ‘I spent most of my career’ outsourcing." "David Perdue has run aggressively as a 'job creator,' touting his record as a top executive with Fortune 500 companies as the chief selling point in his Georgia Senate campaign. "Yet during a controversial chapter in his record — a nine-month stint in 2002-03 as CEO of failed North Carolina textile manufacturer Pillowtex Corp. — Perdue said he was hired, at least in part, to cut costs by outsourcing manufacturing operations overseas. Perdue specialized throughout his career in finding low-cost manufacturing facilities and labor, usually in Asia. "During a July 2005 deposition, a transcript of which was provided to POLITICO, Perdue spoke at length about his role in Pillowtex’s collapse, which led to the loss of more than 7,600 jobs. Perdue was asked about his “experience with outsourcing,” and his response was blunt. "'Yeah, I spent most of my career doing that,' Perdue said, according to the 186-page transcript of his sworn testimony..."
"Wonderful Instant Karma: Republican Voter Suppression Tactics Take Out Their Own Candidate!" "Arkansas Attorney General candidate Leslie Rutledge, a Republican nominee, was kicked off the voter rolls after it was discovered that she didn’t cancel her previous voter registrations in Washington D.C. and Virginia, and neglected to re-register in Pulaski County when she moved. And while she’s crying foul, the County Clerk for Pulaski County, Larry Crane, said that he was legally obliged to remove her name after he received a letter that flagged the issue. 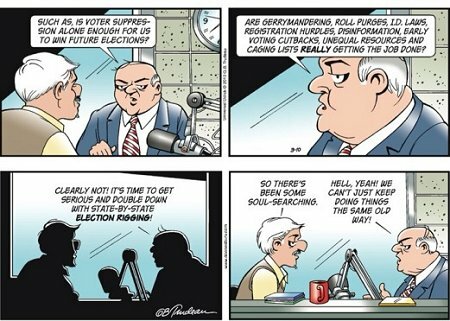 The Republicans are calling the cancellation of Rutledge’s voter registration form a 'dirty trick' that was politically motivated, but it was anything but. It’s becoming increasingly common in Arkansas after the state implemented a number of strict voter restrictions, among which were the controversial voter ID law that, as of Thursday, was still being litigated in court. "These strict voter ID laws caused chaos during the primary; voters were inappropriately grilled on their personal information at the polls and many absentee ballots from legitimate voters were thrown out because they didn’t include proof of ID. "Rutledge argued that she tired to register to vote in Pulaski County, but that clerk’s office gave her a 'change of address' form instead. Rutledge told the website ArkansasMatters.com that 'I don’t know if I made any mistakes except listening to the clerk and I should have insisted they accept my form when they refused it...'"
And after seeing these examples of Conservatism at work in the polls, how can you not help voting for the Cons? After all, they are issue-oriented, and for those with a predilection for negativity all of their issues start with the word, "NO." If you've been paying attention to this site, you know that the Cons have a TERRIBLE time at election time, although techniques they learned from their public relations boys and gerrymandering have kept many of them in power. The Conservatives have a monopoly on the nastiest ways to kill democracy -- and their own people -- and the American Taliban is then "forced" into voter intimidation, vote suppression, vote theft, and voter machine fixing because even the Low Information Voter is starting to "get it." When a political party in a democracy calls for a class warfare that ends in theRule By The Rich they lose votes, so the Cons HAVE to cheat, lie, and steal.